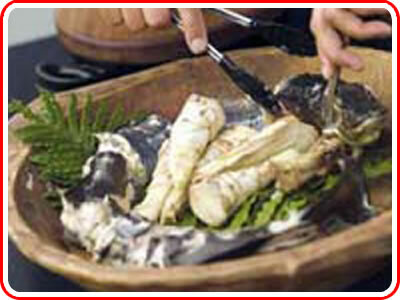 This hearty fare combines the naturally oily texture of the tuna or freshwater eel with the earthy flavour of the ti kouka or cabbage tree and is simple to prepare and a healthy way to eat tuna. Note: tuna is the Maori word for eel and should not be confused with the fish called tuna. Time: Allow about 3 hours. Serves 4.
similar to preparing roast pork. This releases the natural oil that helps stop the tuna shrinking. 2. Turn the fillets over and cut each into two pieces. 3. Place the tuna, onion and ti kouka into a stockpot, cover them with water and gently bring them to the boil. Skim off any impurities and reduce the heat to low. 4. Simmer gently for 2 hours, until cooked through. 5. Adjust the seasoning to suit your taste. 6. Add the sliced cabbage 15 minutes before serving. Serve the tuna and vegetables as a delicious soup or appetiser during cold winter months.